You don’t have to go any further than the opening credits of this one to know that it’s one of the titans of film noir. Based on a novel written by James M. Cain (The Postman Always Rings Twice), the film was directed by Billy Wilder (Sunset Boulevard) with a screenplay by Wilder and Raymond Chandler (The Big Sleep). 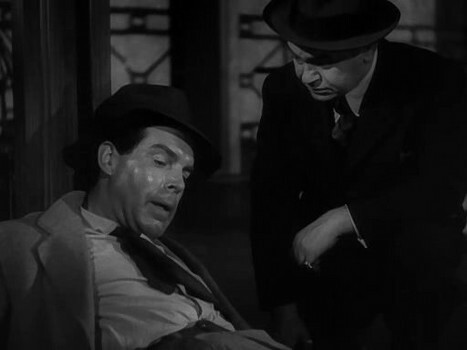 The only thing you may wonder about is that it stars Fred MacMurray. If you only remember Fred from his days inventing Flubber and advising My Three Sons what to do about their gender confusion, you’ll be pleasantly surprised that Fred makes a very convincing murderer, schemer, and dude who was a little too smart for his own good. 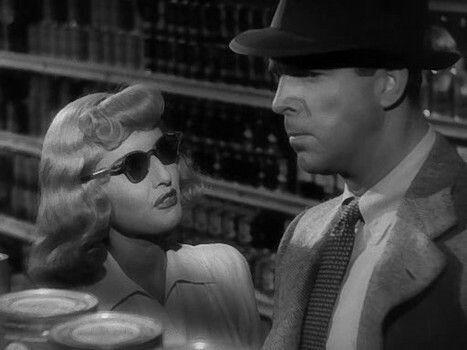 You won’t be surprised to see Barbara Stanwyck as the beautiful dame who destroys every man she breathes on. That character is typical of these movies and Stanwyck is more than up to the challenge of appearing to be played by Fred while in fact she was really playing him in a much bigger way. Also along for the ride is Edward G. Robinson playing a claims investigator named Keyes who works in the same insurance office where Fred works as a salesman. Keyes spends a lot of time talking about some “little man” inside of him that he always listens to. It’s a little creepy since Eddie is so little to begin with and you wonder if he isn’t going to go psycho some day if his “little man” gets particularly ornery. 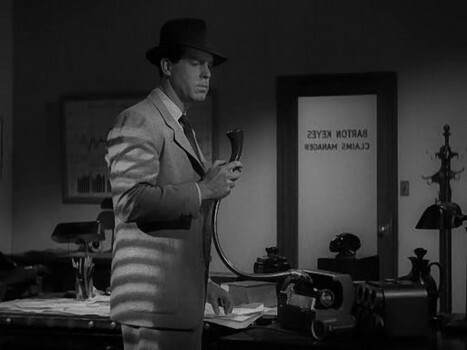 MacMurray’s Walter Neff stumbles into his insurance office in the middle of the night, obviously wounded and records what happened to him on a Dictaphone. Walter is immediately taken with Phyllis and engages in some pretty raunchy repartee (well, raunchy for 1944) that involves some fantasy of his where she’s a cop who pulls him over for speeding and gives him a warning and raps him across the knuckles and I think you know how it all ends up if you’ve ever read the “Letters to Forum” in Penthouse. Walter gets a time set up with her where he can come back and meet with the husband to go over the insurance paper work and that should be that, right? Not exactly because when he goes back over there, the old man is still gone and she’s all about whining and complaining about her husband and his bitchy stepdaughter Lola. She’s also whining about how he’s not as rich as he seems and starts to wonder about a life insurance policy on him. Walter has been around the block a few times in his life though and immediately sees that she is looking to bump the old codger off. He acts put out about it and leaves in a huff. Of course after he leaves, he immediately begins to formulate a plan that would be foolproof and allow them to kill the guy and collect the money! Walter has been in the biz long enough that he figures he can be the guy to beat the system. The big problem though is to get the claim past Barton Keyes and that dang little man inside of him that suspects every single claimant as being a scammer. The plan is simple. And by simple, I mean that it involves an insurance policy with a double indemnity clause, a strangling, a body dumping, and a train ride in disguise. In fact, it’s such a simple plan that almost as soon as Walter puts it into action, things begin to unravel! A great movie that reveals its twists and turns at the right time for maximum effect. The best part is that these doublecrosses aren’t so outlandish that they’re unbelievable. The viewer gets to slowly realize along with Walter that he wasn’t the clever guy he thought he was and that he was being manipulated by Phyllis the moment he walked in the door. 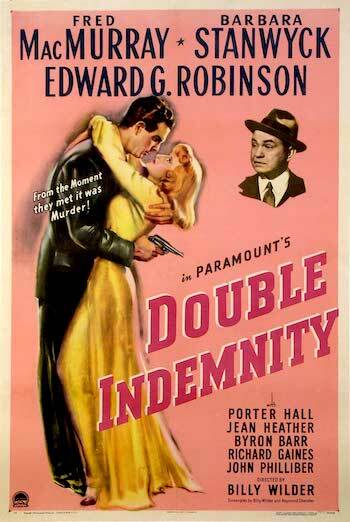 Double Indemnity easily remains one of the toughest pieces in the film noir oeuvre, offering an apocalyptic look at love and trust and coming to the conclusion that neither exist, both supplanted in the film’s world by opportunistic and deadly liaisons. At least that’s what the little man inside me keeps saying.